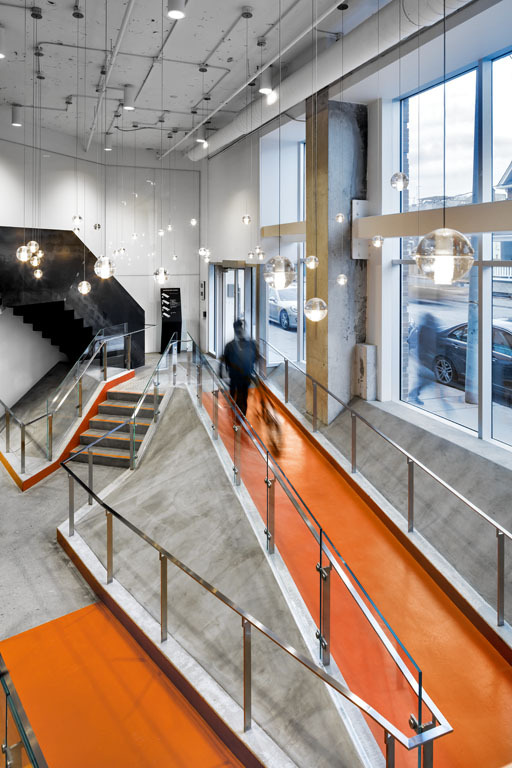 Orange highlights and striking forms lead from the street through the lobby in this renovated commercial building that proposes adaptive reuse can re-engage the city and become an exemplar for universal access. The new lobby relates the street to the new entrance and opens up the former basement as a lower ground level, establishing a clear urban connection and distinctive brand for the building with a universally-accessible form. Recognizing the value of a building with a fully inclusive entrance and a bold identity, the building’s owner gave up leasable space in order to transform the entryway into a striking statement at grade, with a series of ramps that demarcate the property as a creative hub open to strollers, bicycles and mobility devices. The Quadrangle-led team’s solution for the 100 Broadview Avenue lobby effectively uses universal design on a number of levels to welcome those with vision loss and all levels of mobility. 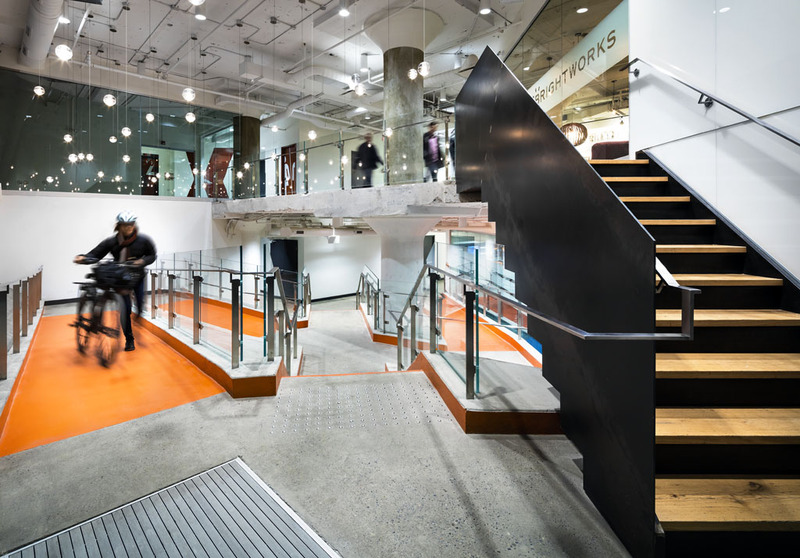 The first impact upon entering the lobby is a dynamic and interesting space: vibrant, high-contrast pathways give visual clarity, while the bold, orange feature ramp accommodates mobility devices of various widths. 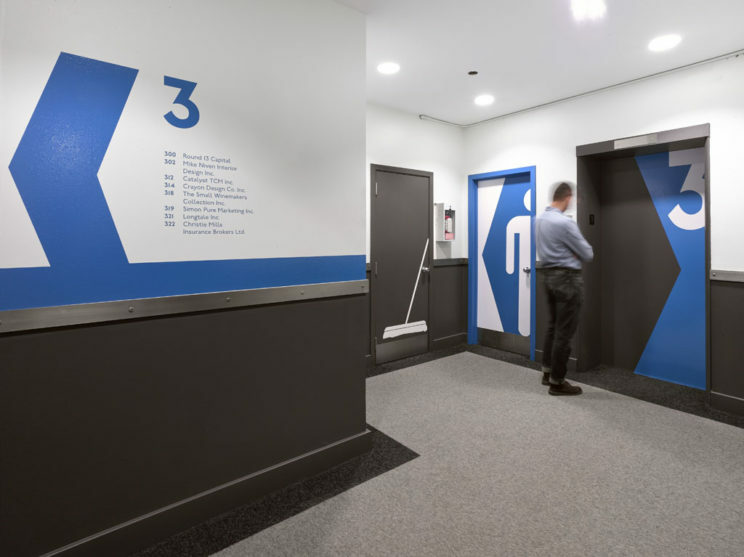 Additionally, colourful, custom-designed wayfinding elements are carried throughout the building's hallways and shared areas to provide clear navigation and branding. *Design led by Quadrangle with support from Human Space, formerly AccessAbility Advantage. 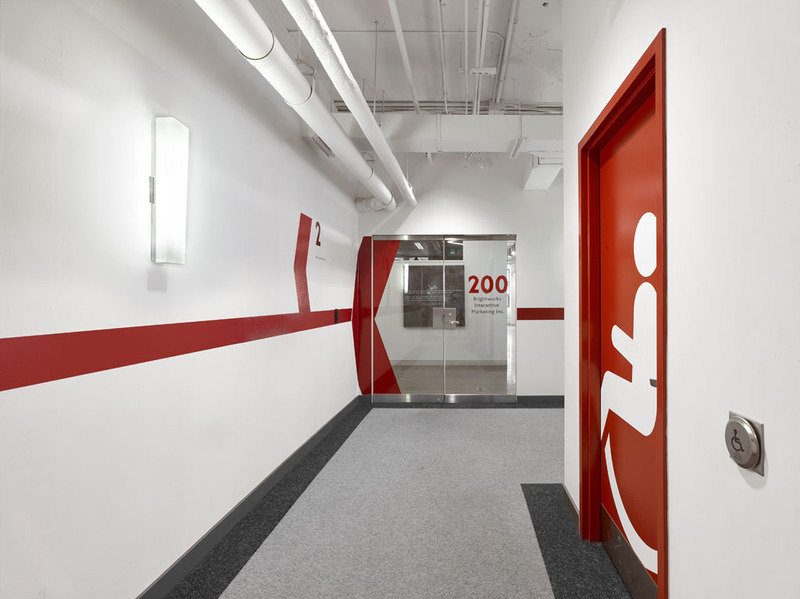 The bright red wayfinding elements identify this as the second level of this successfully revitalized commercial office building. Colourful, custom-designed wayfinding elements are carried throughout the building's hallways and shared areas to provide clear navigation and branding. Vibrant, high-contrast pathways give visual clarity, while the bold, orange feature ramp accommodates mobility devices of various widths. 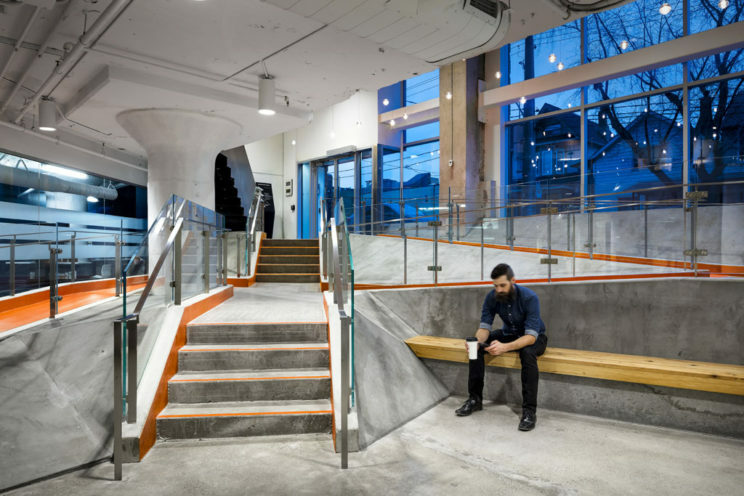 The design for 100 Broadview's lobby won numerous awards, including a Silver Award from the International Association for Universal Design (IAUD) Awards in Japan. With its feature ramp and bright, high-contrast pathways, 100 Broadview demonstrates how universal design goes beyond mere accessibility.